Connecticut Senate Republicans today announced that their gain of three new seats will create an even split between Democrats and Republicans in the state Senate for the first time in over 100 years. (Left to right) Senate Minority Leader Pro Tempore Kevin Witkos, Senator-elect Len Suzio, Senate Minority Leader Len Fasano, Senator-elect George Logan, Senator-elect Heather Somers, Senator-elect Craig Miner. All Senate Republican incumbents retained their current seats and Republicans picked up three new seats with the elections of George Logan of Ansonia in the 17th district, Heather Somers of Groton in the 18th district, and Len Suzio of Meriden in the 13th district. New senator-elects also include Craig Miner of Litchfield who was elected to represent the 30th Senate district, a seat held by Republican Senator Clark Chapin who is retiring. “There is no longer a majority party in the state Senate. We are now a chamber of equals. The old way of doing things is over. With this historic balance I look forward to a completely new dynamic in the state Senate that embraces collaboration and cooperation and that equally values all ideas and perspectives. 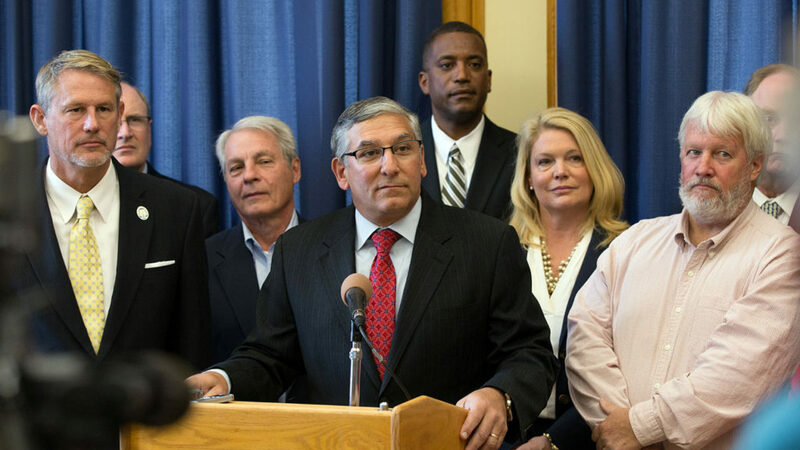 This is a defining moment for Connecticut to change the way state government operates for the better,” said Senate Minority Leader Len Fasano (R-North Haven). “I want to congratulate each of our senators and senator-elects for their incredible hard work and dedication to keeping the focus on the issues that matter most to the people of Connecticut. Thank you to our volunteers, our families and our friends as well for the constant support. And thank you to the people of Connecticut for putting your trust in Republicans to change the course of our state,” said Fasano.